The season is looking bright for the Decorah girls’ tennis team as it collected its second win of the season with a new line-up and finished third at the Top Gun Tournament last week. Once again, Decorah faced defending Class 1A state champion Waterloo Columbus, Saturday, April 6, in Waterloo, taking third in the tournament that featured several strong eastern Iowa teams. With 33.5 points, Waterloo Columbus took first place, while Clinton finished the day second with 27.5 points. Decorah scored 20 points for third and Ottumwa was fourth with nine points. Highlighting the day for the Vikings was Soleil Smith in the number-six slot, winning all three of her matches to finish first in her singles flight. At each of the other five singles spots, Decorah took third; these included Mara Frieden (at No. 1), Alli Groux (at No. 2), Mya Herrmann (at No. 3), Josie Kleckner (at No. 4) and Cady Peterson (at No. 5). In doubles, the Vikings earned third-place finishes across the board. Frieden and Groux teamed up in the first slot; Sophia Maguina and Payton Schutte at the second; and Peterson and Morgan Brauer at number three. “The nice thing about this tourney is that we will see both Columbus and Clinton in two weeks when the girls participate in the Clinton Invite, along with several other top-notch opponents,” said Coach Berland. 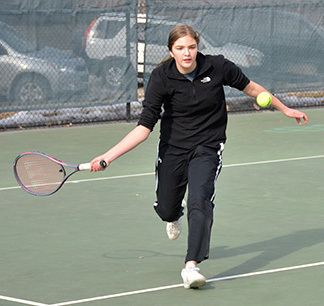 The Decorah girls’ tennis team sealed up its second victory of the year with a solid team effort despite cool temperatures and at times, gale force winds, Tuesday, April 2. Making use of the Vikings’ team depth, the squad mixed up the lineup from their victory the previous day to take a bite out of the Oelwein Huskies, 9-0, winning all matches. Soleil Smith stepped into the Vikings’ top spot and did not disappoint as she stopped Megan Baerg in a pair of 6-0 matches. At No. 2, Mya Herrmann was always on the attack, using good ball placement to shred Taylor Gish’s defense and finish on the high side of the score, 6-1 and 6-0. Up and down the line-up, Coach Berland was pleased with the efforts put forth. In doubles action, Decorah only gave up a total of three games in winning all three doubles matches. The Vikes are back on the courts today Tuesday, April 9, at Charles City at 3 p.m.